Most people think that riding motorcycles is simply like riding a bicycle -- as long as you can balance on a bicycle, you are ready to go on the open roads and ride a motorcycle like Moto GP Champions, Valentino Rossi and Marc Marquez. Unfortunately for many, that same mindset and lack of necessary skills to ride a motorcycle has gotten them into serious injury or worse, death. It's not like there's no better way to learn to ride. Many organizations and motorcycle clubs here in the Philippines offer basic safety riding courses for riders. However, due to limited time and lack of focus on each individual rider, the results are sometimes not as fruitful as they are hoped to be. Then came the California Superbike School. The California Superbike School first came to our shores 5 years ago. Keith Code, a former professional motorcycle racer started doing one-on-one coaching sessions with amateur racers in 1976 and some of them quickly became national champions. Due to this success, he was encouraged to develop written materials and a system of learning the technology of riding – the first in his field at the time. And in 1980, he founded the now world-renowned California Superbike School (CSS). Over the course of its 38 years of existence, CSS has trained over 150,000 students from its branches all over the world, counting superbike racing champions among its alumni. Keith Code also authored popular the motorcycle riding instructional videos and books, “A Twist of the Wrist” (Vols I and II) and “The Soft Science of Road Racing Motorcycles.” Keith Code himself may not have been physically present, but his lessons are taught by experts from Australia, US, UK, Greece and New Zealand over the course of the 2 days of school. Like attending school when we were kids, CSS offers a structured curriculum to tackle every aspect of motorcycle riding in four levels. In each level, it is dissected into drills that will complement the previous level and won’t overwhelm the student. A good example is the throttle control exercise – an often-overlooked skill in motorcycle riding. This aspect was explained and made easy to understand in a series of drills and classroom sessions. Another great thing about the CSS is that coaches will be observing and riding with you on the track and will debrief with you after each track session, putting focus on the improvement of each individual student. Learning the correct techniques of cornering and riding in general from the best is cool, but doing that and riding a BMW superbike is way cooler! BMW Motorrad Philippines, the exclusive distributor of premium BMW motorcycles in the country supported the event by providing a dozen demo bikes (8 S1000RRs, 1 S1000R, 1 S1000XR, 1 F800R and 1 RnineT Café Racer) for the coaches and participants. The S1000RR – the same bike that is ridden by reigning Philippine Superbike Champion, Marvin Mangulabnan, was the perfect bike for the drills, giving pro and newbie riders alike the same level of riding confidence despite the difference in their riding skills. These S1000RR demo superbikes are up for grabs at discounted prices: P350K off if you are a CSS student, P175K off for non-CSS students (terms and conditions apply). Why bring the CSS to the Philippines? 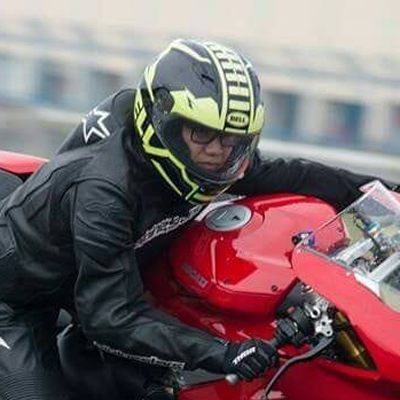 JP Tuason, one of the leading figures when it comes to formal driver schooling with his Tuason Racing School (TRS) together with his team brought the CSS here in the Philippines with the goal of making every motorcyclist a better and safer rider. Asked if they have plans to offer the CSS to the mass market in the future, his reply was “Yeah, definitely!” “Actually we (with his business partners) just had that conversation last night. What we've been wanting to do for the last year is to trickle our program into a small bike program. So at the moment, we're concentrating on big bikes, but we see the need and the importance of doing similar training but for riders on smaller bikes. Obviously, cost is a consideration so we're now in talks with the California Superbike guys (CSS). They run a small bike training program in the US, it's mostly for the military. Hopefully by the end the year or beginning of 2019, we'd like to take that program [small bike training] to the Philippines and launch it for the mass market,” JP added with great enthusiasm. Personally, I can’t express in words how my riding had improved since completing 2 levels of CSS, but as JP Tuason puts it: “The really interesting thing that all of our students get out of this and not only myself is that people know how to ride a motorcycle to get them from point A to point B. But it’s more of through personal experience [only]. “So you're doing this, great! You're able to survive, [then] Oops! Something almost happens and then you're like, ‘what happened there?’ You don't know.” – emphasizing on the fact that most motorcycle riders only know how to ride the bike but don't have the skills yet to ride their motorcycles safely. “What we do at the school is we take the education from the very basic (points to an earlier drill from Level One), then we build it up and along the way, we explain step-by-step why each step is important and how it relates to your riding in terms of becoming better. So when you understand the dynamics of how a motorcycle actually operates when you do the exercises, it makes sense, you get it. Why you are doing this input, how it affects the bike and eventually makes you a better and safer rider. CSS Philippines also expanded their operations to the rest of SE Asia. In 2016, JP Tuason and his business partners brought their operations to Malaysia for the California Superbike School Malaysia, which was held in Sepang International Racing Circuit. Earlier this year, they’ve gone to the Buriram International Racing Circuit for the California Superbike School Thailand. During a small talk with one of the CSS coaches, Lyle Warner, who hails from Oregon, USA, we asked him how he feels about his experience here coaching the locals. The California Superbike School Philippines is a 2-day program offering Level 1 to Level 4 Courses instructed by a team of CSS coaches from around the globe. The California Superbike School Philippines 2018 is supported by BMW Motorrad Philippines, Tuason Racing School, MotoPinas.com, Cleanfuel, HSI (Hi-Speed Superbike Incorporated) and Euro Monkeys.